You can learn to drive...guaranteed! Robodrive is the way forward in learning to drive. A Driving instructor has created an innovative way for learners to master the road-using their mobile phones. Tony Allen created the Robodrive app earlier this year after recognising how expensive and time-consuming learning to drive can be. He decided to design something to help people learn to drive at a lower cost and at a faster pace. Robodrive, which can be downloaded free on iphone and Android devices, enables people to learn the basics of driving at home without a car. The app consists of 19 short video clips which show physical routines to practice at home which will prepare the user for their driving lessons. It was previously an online course, before Tony decided to take it mobile. Speaking of his motivation to create the app,Tony said; "We would go and speak to young drivers and, obviously, when we asked who wanted to learn to drive, they all put their hands up. "But when we asked if their parents had the money to pay for their lessons, only a few put their hands up. So, I decided to create the app to cut costs. "The app mostly works on muscle memory. If you practice doing an action you would do while driving, like changing gears, for 10 minutes,your muscles remember it when you are next in the car. "A lot of people do not have access to a car outside of their lessons when they are learning to drive, so this allows them to practice what they have learned outside their lessons, meaning they will progress faster. "The videos prepare learner drivers for their lessons, help to eliminate nerves and give them additional confidence when it comes to taking their test. "It's also guaranteed to save them a lot of money. "It's a small fee for each video, but that's a small price to pay in comparison to the cost of hour-long driving lessons,"
Tony, of Baglan, says he sees the app as part of the future for teaching peopleto drive. He said; "This app is the new way to learn and teach yourself to drive. It's the future of learning to drive." This will reduce the time it takes to learn to drive, give you additional confidence when it comes to taking your test and save you lots of money. guaranteed! After a pupil uses the Robodrive system it enables me as a driving instructor to guarantee that : within your first two hours in the car you will experience all the points below. If you can't do that your next two hour session will be free! "This is a new way to teach yourself to drive". Just had my first lesson, and to say it was brilliant is an understatement. I felt so relaxed in the car and I felt like I had been driving for ages. The Robodrive system is brilliant. And I would definitely recommend Robodrive to anybody who is going to start learning to drive. So I've just passed my driving test after learning to drive with Tony Allen and I've got to say he's the best instructor i've ever had. After being ripped off by other instructors, spending ridiculous amounts of money and not learning a thing I gave up on driving for three years. I had to redo my thoery and learn all over again because I was taught in a incorrect manner which didn't sink in. However the robo drive way allowed me to kick all the bad habits taught to me by previous instructors and learn with a fresh slate and I can't thank Tony enough for removing my fear of the road and driving and showing me that anybody has the ability to drive! I can't thank Tony enough and I hate to admit that I wasted so much time and money with previous instructors only interested in making quick cash for very little work, where as Tony at Robo drive genuinely wants and enjoys teaching people the right way with no selfish means, he is a genuine star and the best instructor anyone could wish for! 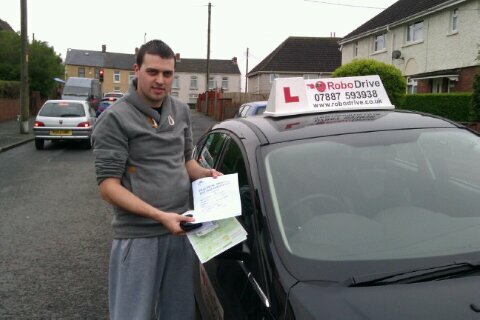 I'm a university student from London and I have taken many driving lessons from another instructor. When I came to university I had to look for another instructor so I initially chose Robodrive because of its amazing reviews on this website. Despite all the amazing reviews I still couldn't help think that "surely he couldn't be much different to any other instructor". YOU WILL LITERALLY BE AMAZED! YOU WON'T BELIEVE THE DIFFERENCE UNTIL YOU TRY ROBODRIVE! Most instructors would generally teach you at a slow pace to take as much money from you as possible. Not with Robodrive! - You learn 6-7 times faster! - A completely different approach to teaching which makes it literally impossible to fail. - Additional practice videos which allows you to programme your mind to learn how to drive in your own home! - ALL OF THE ABOVE AT A COMPETITIVE PRICE! robodrive system was to learn and wished i had done this along time ago its quick and affordable and made me more confident the robodrive videos is a very good idea as i could learn from home as well as my lessons ,if it werent for robodrive i dont think i would have passed its taken me 1 week to learn the robodrive system and i passed , thank you tony thanks for learning me the robodrive system . "the Robodrive system is so straight forward and ingenious. " " with Robodrive I soon felt comfortable behind the wheel." " Robodrive is the way forward in learning to drive." "we can't praise the Robodrive system enough." at home at my own pace,"
"The Robodrive system is what you want,"
only a short time learning." "lucky to have been taught the Robodrive system"
the roads would be safer."